Boy, it feels great to be back home, again! My first night was really disturbing and exciting at the same time, because I had been feeling so good when I left the hospital, but upon settling in for the night, I found it much more difficult to breathe, walk, and pains started growing in places I hadn’t noticed before I got home. Apparently, it’s quite normal to have a first couple of nights of a sharp drop in strength upon returning home from a controlled environment. Knowing this really helped me to endure. Other things that add to the shock is just the change of ease from living in one hospital room vs living in an apartment. 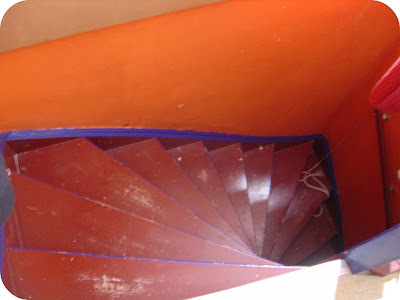 For instance, as part of the design of our apartment, I have to go down a tight spiral stairs to get to the bathroom, so when completely weak and out of breath, this was a very daunting journey. Of course, the best part of ALL of this is that my health is returning (slowwwly, but surely) and that I am home with my boyfriend where we can finally collapse into the reality that we are not going to lose each other anymore over this. Those were some painful and terrifying days for both of us and now we just get to experience the relief and the patience for my recovery. I am really lucky to have him in my life. I hate being dependent and completely reliant on someone for the simplest things, so this is a real challenge for me. It’s also a challenge for him since he’s never had to have someone so dependent on him. Somehow, despite some minor grouchiness at times from both of our parts over this challenging adjustment, we both know what is important in the end and we have to trust and love and endure… and we do. Because we really do love each other beyond all of this. So here’s a little vlog to show you my skinny lil body and that I am walking and talking and being as normal as I can be within a few days of having been in a coma and almost dying! Yeesh, as much as I wish to be better NOW, it is still amazing to me that I am in this good of condition after such a shock of last weekend. Wow. We can be amazing creatures. I’m glad to see you’re getting better and that you’re smiling. I enjoy your little videos. Keep doing them. I love you Troy! I’m thinking about you everyday and am so glad to see you’re recovering so quickly. Thanks for the video clips. i was truly crushed to hear of your ordeal. please take care of yourself , my thoughts are with you.